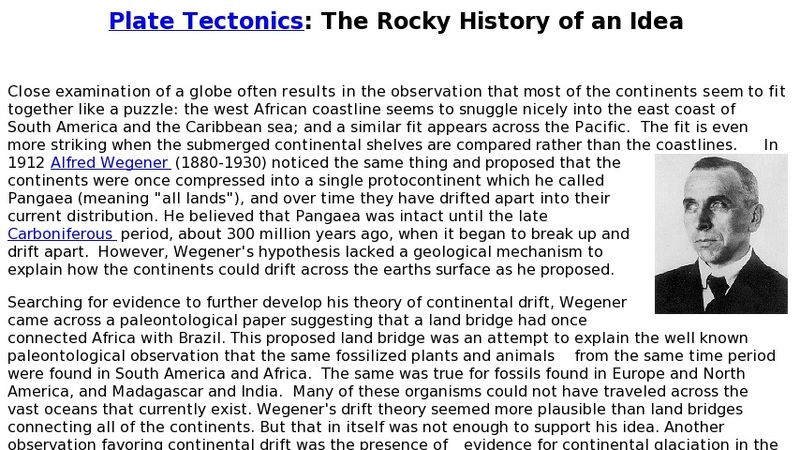 Information on this site about the early history of the Theory of Plate Tectonics begins in 1912 with Alfred Wegener (1880-1930), who noticed that most of the continents seem to fit together like a puzzle. The west African coastline seems to fit nicely into the east coast of South America and the Caribbean sea, and a similar fit appears across the Pacific. He proposed that the continents were once compressed into a single protocontinent, which he called Pangaea, and over time they have drifted apart into their current distribution. The site includes further information that convinced Wegener of his theory and also the suggestion of Arthur Holmes that there were convection currents in the mantle. Lastly there is mention of sea floor spreading as suggested by Harry Hess and R. Deitz.